Don't Leave Your Father, Kate. To spend a Summer's Sunday in frolic until dark. The ride on the cars was lovely, we left all troubles behind. There was Annie with her mother, her father and his friend. All carrying loads of baskets with plenty meals and candies. 'Twas then while Kate and her brothers were romping on the green. Remember there are rivers and creeks which full of sharks. So don't leave your father, Kate, while you're in the park. So Kate, Annie and two others, they took a stroll, they say. Wandering from the picnic grounds, and thinking it no harm. They reached the lovely Schuylkill, it had a peculiar charm. Have ice cream, cakes and lager, and a little boat ride. On the Wissahickon, the lonely, they passed the hours away. 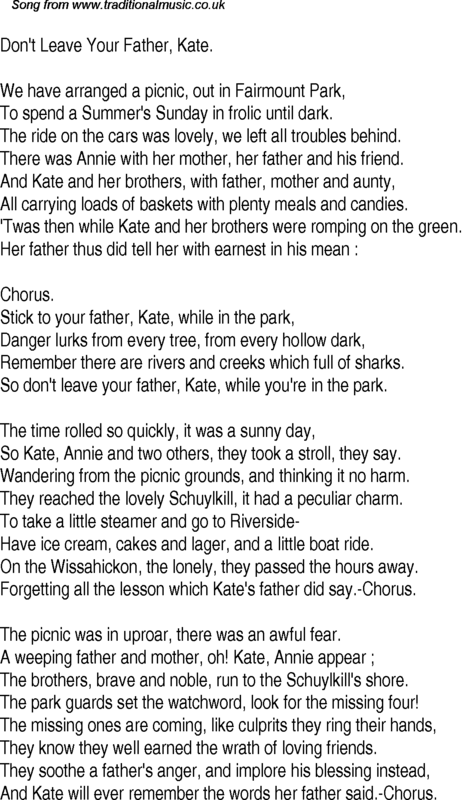 Forgetting all the lesson which Kate's father did say.-Chorus. The picnic was in uproar, there was an awful fear. The brothers, brave and noble, run to the Schuylkill's shore. The park guards set the watchword, look for the missing four! They know they well earned the wrath of loving friends. And Kate will ever remember the words her father said.-Chorus.